Jenn and Romy: Romy Passed Prelim Exams at Berkeley! Today the Mechanical Engineering department posted the test results of all of the graduate students who took the prelim exams in mid January. In order to be allowed to pursue a PhD in the Mechanical Engineering department, you must pass a set of exams. There are 10 exams, of which you must pass in at least three of the subjects, and one of the subjects must be your major. The subjects are: Dynamics, Controls, Heat transfer, Design, Solids, Materials, Thermodynamics, Fluid mechanics, and Manufacturing. Romy took the thermodynamics, fluid mechanics, and solid mechanics subject exams in August, but did not pass the solid mechanics subject exam. Since he passed his major subject area (thermodynamics), he was allowed a second chance (as are almost all of the grad students who don't pass all three the first time) so he tried the solid mechanics and heat transfer subject exams this January. He only needed to pass one of the subjects to pass the prelim exam, but he actually passed both of them. I went today to check the results which were posted near the student services office, and took a picture because I was so happy to see the results!!! 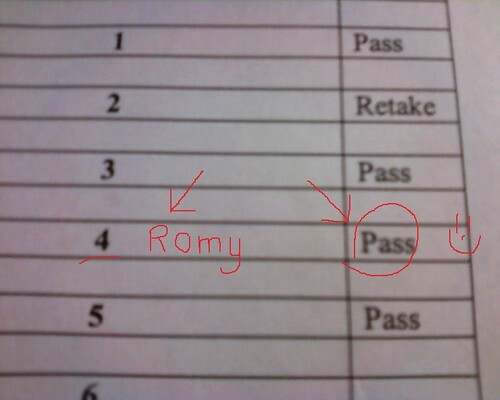 Romy passed the prelim exams! He was #4. In case you're wondering about my exam results, I don't need to take the prelim exams because I am only doing a Master's of Science degree in Mechanical Engineering. I will be finishing my Master's at the end of summer 2010 (I hope!) and then I'll be starting the PhD program in the Earth and Planetary Science department researching geological fluid mechanics.